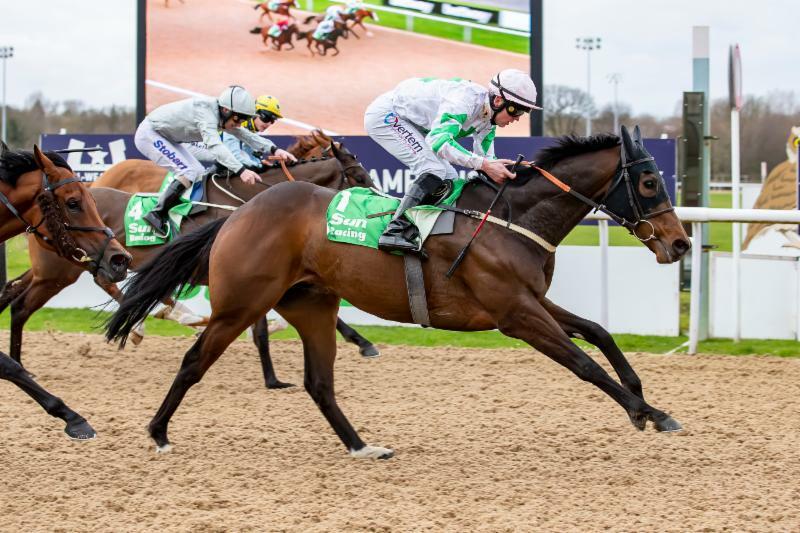 It has been a tremendous few days for North Yorkshire-based trainer David Barron and on Saturday 9th March he landed the £50,000 Listed Lady Wulfruna Stakes (3.15pm) on Tapeta at Wolverhampton with Above The Rest. The extended seven-furlong Tapeta contest was the final Fast-Track Qualifier of the sixth All-Weather Championships, with Above The Rest gaining a free and guaranteed place in the £150,000 Sun Racing All-Weather Mile Championship on Polytrack at Lingfield Park on the £1-million All-Weather Finals Day, Good Friday, April 19. Above The Rest (David Barron/Clifford Lee, 18/1) disputed sixth place as Arcanada (Tom Dascombe/Richard Kingscote, 16/1) took the eight-strong field along at a good pace. Arcanada continued at the head of affairs as the runners entered the final furlong, but faced challenges from firstly Cardsharp (Mark Johnston/Joe Fanning, 10/1) and then Above The Rest and Island Of Life (William Haggas/Andrea Atzeni, 7/1). It was Above The Rest who got up in the last half-furlong to score by a length from Island Of Life, with Cardsharp another short-head away in third. Arcanada was fourth, a further neck behind. The well-supported 5/4 favourite Oh This Is Us (Richard Hannon/Tom Marquand) was never able to get competitive and came home in seventh place. The winning time was 1m 26.25s. Above The Rest was making his first start in the UK since finishing fourth in another Fast-Track Qualifier, the Listed Betway Golden Rose Stakes at Lingfield Park on November 17. In the intervening period, the eight-year-old son of Excellent Art has made two outings at Meydan, UAE, including when fourth on dirt in the six-furlong G3 Dubawi Stakes. He is a proven performer on All-Weather surfaces, recording his biggest success in the six-furlong G3 Chipchase Stakes on Tapeta at Newcastle in June, 2018. Barron also won a Fast-Track Qualifier at Chelmsford City on Thursday, March 7, with Clon Coulis gaining a free and automatic place in the £150,000 Ladbrokes Fillies & Mares Championship on Good Friday. The trainer said: "Lingfield would on the cards now for Above The Rest. Good Friday is obviously still a little way away, but there is every possibility that he could head that way." Although today's success means Above The Rest is qualified for a free and guaranteed place the Sun Racing All-Weather Mile Championship, the trainer believes the horse to still be more of a sprinter. He continued: "Above The Rest has never run over a mile while we have had him and I think he is a sprinter. He does get seven furlongs but, on what we have seen, he doesn't get any further than that." Barron also gave an update on Clon Coulis. He said: "The plan at this stage is that Clon Coulis will also head to Good Friday after her win on Thursday at Chelmsford. It has been a good week." Winning jockey Clifford Lee said: "Above The Rest didn't like it out in Dubai, but he has come back and run a good race today. "He has returned in perfect form. We went a good gallop and David said to drop him out, get a bit of cover and ride a race." All the Fast-Track Qualifiers for All-Weather Championships Final Days have now been run. Horses can continue to qualify for All-Weather Championships Finals Day by running a minimum of three times on All-Weather surfaces in Great Britain, Ireland and France; or twice on the All-Weather surfaces in Great Britain, Ireland, France and once on dirt in Dubai up until Saturday, April 13. A horse must then be rated high enough to 'make the cut' in a final by order of its BHA rating. 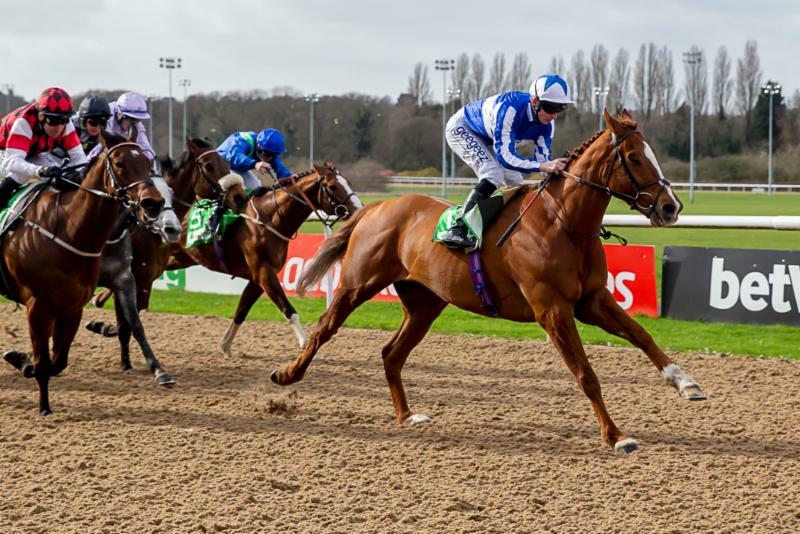 Earlier on the Wolverhampton card, Zwayyan (Andrew Balding/David Probert, 9st 2lb, 7/1) defied a 140-day absence to win the £50,000 sunracing.co.uk Lincoln Trial Handicap (2.05pm) over an extended mile. 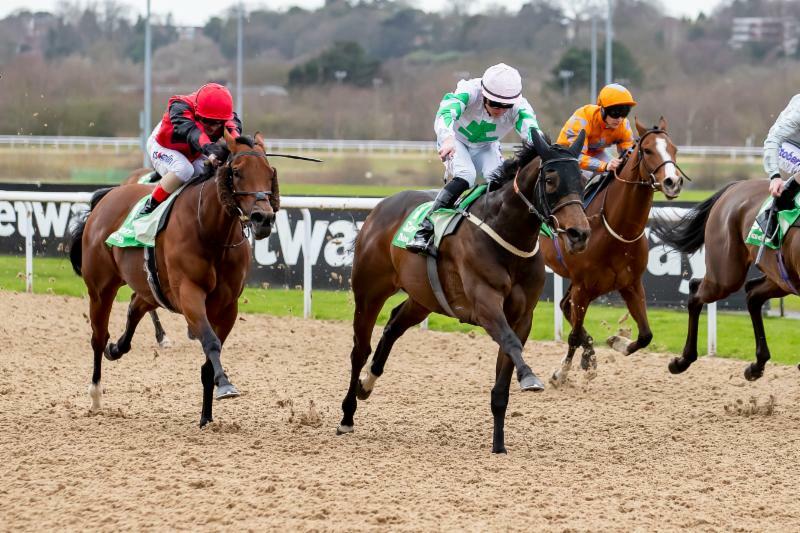 The six-year-old Pivotal gelding, who is owned by King Power Racing, maintained his 100 per cent record on All-Weather surfaces, having won a mile optional claiming handicap on Polytrack at Chelmsford City in August on his only previous All-Weather start. Zwayyan was held up at the rear of the 13-runner field before being delivered to challenge entering the final furlong. He ran on well inside to score by a length from Breden (Linda Jewell/Robert Winston, 9st 3lb, 14/1), with Third Time Lucky (Richard Fahey/Paul Hanagan, 9st 3lb, 14/1) another three-quarters of a length away in third. The winning time was 1m 47.31s. Jockey David Probert confirmed afterwards the that the £100,000 Unibet Lincoln Heritage Handicap, run over a mile on turf at Doncaster, on Saturday, March 30, is now a target for Zwayyan.